ATLANTA – There were plenty of people who did their research, scoped out the best buys, figured out their budget and set their sights on Cyber Monday, one of those holiday events where many of us upgrade our wardrobe, electronics or household. Who knew Alex Anthopoulos also had that day circled on his calendar? Now granted, the Braves general manager probably did not set out specifically to make the first two moves of this pivotal offseason on the same day you were saving 30 percent on a pair of jeans and a flat-screen TV. But when you slip on those new jeans and fire up that TV come April, you’re going to see a familiar face and a hugely impactful face wearing Atlanta Braves jerseys. Atlanta welcomed home longtime catcher, Duluth (Ga.) native and eternal fan favorite Brian McCann on Monday, signing the veteran catcher to a one-year, $2 million deal. Injuries and decreased offensive production diminished his impact the past two seasons in Houston, but one of the better framing catchers in the game did help the Astros win the 2017 World Series. Reportedly, the soon-to-be 35-year-old turned down more lucrative offers for the chance to play in front of family and friends in his hometown. Certainly, this move did not move the needle holistically as much as it did for sentimental reasons. This correspondent even tweeted that this move did not look great at the moment, but likely would in a month or two given the moves that would come, taking care of the catching position, not spending but a mere pittance (in baseball terms) to get it done. After all, this is not the same player who made seven All-Star appearance wearing an Atlanta uniform earlier in his career. Then came news – merely minutes after McCann’s signing was announced by the club – that made adding a catcher who hit .212 in 63 games last season much more tolerable, sentiments be darned. The Braves inked slugging third baseman Josh Donaldson to a one-year, $23 million deal late Monday, reuniting the former Blue Jay with Anthopoulos, the general manager who acquired the Auburn University product after the 2014 season to help Toronto reach back-to-back AL championship series. That’s a lot of money for a guy who, like McCann, has dealt with injuries the past two seasons. But any return to form for Donaldson, who will be motivated to parlay this one-year deal into a huge free-agent contract come next winter, would pay tremendous dividends for an Atlanta lineup that – for all its sizzle and shine a season ago – lacked the right-handed power threat to slot behind Freddie Freeman in the cleanup spot. There’s a lot to like about these deals together, from an inward and an outward perspective. Inward, the Braves are a better team now than they were at sunrise. McCann will provide tremendous leadership behind the plate for Atlanta’s youthful staff, the catcher certainly benefitting from working with the likes of CC Sabathia and Justin Verlander since he left the Braves after the 2013 season. He gained valuable experience playing in the postseason with the Yankees (who he signed with after leaving Atlanta) and Houston, including the 2017 World Series title. Likewise, Donaldson has his share of playoff experience, including the aforementioned two years with Anthopoulos north of the border. The soon-to-be 33-year-old only played 52 games a season ago, but slugged 33 homers with a .944 OPS in 113 games the year before, and only is three years removed from a MVP campaign in which he blasted 41 homers and drove in 123 runs. Anything approaching those numbers in 2019 gives the Braves one of the absolute most dangerous lineups in the NL, hands down. And what of Johan Camargo, the young fan favorite whose anchoring of third base the final four months of 2018 is hailed as one of the reasons the rebuilding Braves transitioned into the playoff-clinching Braves? Folks, I can’t see Camargo going anywhere. He has experience playing three infield positions, will get some work at first base and corner outfield in camp, and profiles exactly as the type of player Martin Prado was at one time and Marwin Gonzalez (McCann’s former Houston teammate) is at this time. Those guys are incredibly valuable. Baseball today has changed. Used to be, the best eight guys played every day. Not anymore. Remember the NLDS, where the Braves fell in four games to Los Angeles? Atlanta’s bench was piecemeal, while the Dodgers routinely brought guys off the bench who could’ve started for the majority of teams in the majors. Camargo will see time on the bench, sure, but also will get plenty of starts spelling Dansby Swanson, Ozzie Albies, Donaldson (the beauty is Donaldson does not have to play 150 games for this deal to be a winner for the Braves), a few starts in a corner outfield spot. Social media lit up immediately after the Donaldson news broke with questions of whether Camargo or Swanson would be moved. My feeling is neither. Anthopoulos and Brian Snitker – ironically, the man who as a minor-league manager told a 21-year-old McCann at Double-A Mississippi in 2005 that he was going to the majors for the first time – realize depth is a need if this franchise is going to play deeper into October in 2019. Donaldson’s addition allows that to happen. Consider that on a particular night, you could have Camargo (or Swanson, or Albies, or Donaldson) as your top option off the bench, with McCann as the second catcher on days Tyler Flowers starts, along with the ever-versatile Charlie Culberson? Beats Ryan Flaherty and Danny Santana. It’d be foolish to think the Braves are done, either. Certainly, Anthopoulos will take some of the remaining payroll flexibility and save that dry powder for spring training or the trade deadline, but Atlanta still has money to spend (even more so if it can find a taker for Julio Teheran, knowing it likely will have to eat some of his $11 million owed for 2019). Were Donaldson an everyday player last season, there is no way he takes a one-year deal. McCann three years ago would not have come home for $2 million. But here they are, and there still is room for the Braves to work. Not to mention Atlanta has dealt exactly zero prospects from its overflowing pantry of young talent. The capabilities are there to make a major move on the trade front, and I think that’s where the Braves will strike next. Could Cleveland’s Corey Kluber be had for a high prospect price, giving Atlanta three years of control of a perennial Cy Young candidate who is a bona fide ace? Could Seattle be enticed to deal outfielder Mitch Haniger and/or closer Edwin Diaz for a big package, allowing the Braves to address corner outfield and closer with long-term controllable pieces? 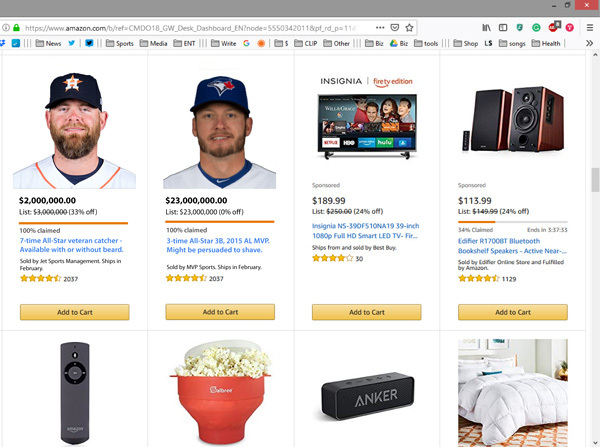 Anthopoulos filled two needs on Cyber Monday. Time will tell if he got the most bang for his buck. And with the Winter Meetings looming and plenty of options on the table, today’s spending spree likely is only the beginning.